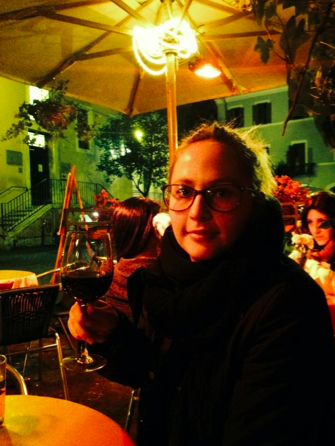 My name is Kamilla Eriksen and I was one of the first GHN students to graduate in 2010 with the specialisation Public Health Nutrition and Food Policy. Since then I have finished two master degrees, one from RUC in Health Promotion and Communication and another one in Nutrition for Global Health from London School of Hygiene and Tropical Medicine. Currently I am enrolled as a PhD student at University of Cambridge and the Medical Research Council in the research area of Maternal and Child Nutrition. Enough said about my educational background lets turn to my latest work experience. I have since May 2014 been employed as a data analyst by the Institute of Development Studies in Brighton, UK. I am working on a Global Nutrition Report with Dr Lawrence Haddad and a handful of experts in the public health nutrition field. It’s the most exiting job I have had so far. The job has, besides from giving me practical experience of how a large project, involving multiple stakeholders from academia, UN and civil society, is managed, also sent me around the world! So far I have been travelling to Nairobi, Kenya to participate in a global nutrition conference on monitoring and evaluation, to Addis Ababa, Ethiopia to participate in a meeting with the Independent Expert Group who assisted in writing the Global Nutrition Report, and last week I participated in the Second International Nutrition Conference (ICN2) in Rome, jointly hosted by the FAO and WHO. The Global Nutrition Report team and I were there to launch the Report in a side event to the ICN2, which meant that I had access to the entire conference. I was able to listen to high-level policy makers, leading experts and public health nutritionists from all over the world in how to move forward in combating malnutrition globally. The first day of the three day long conference, started with 170 countries committing to reduce malnutrition, affecting more than 2 billion people worldwide, as they all signed and endorsed the Rome Declaration on Nutrition and its Framework for Action. 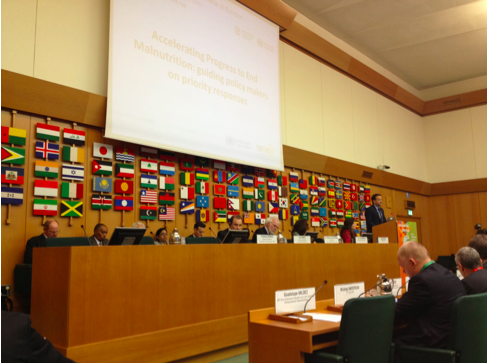 FAO director-general Jose Graziano da Silvia kicked off the conference by stating: “We have the knowledge, expertise and resources to overcome all forms of malnutrition, and governments must lead the way”. It has been 22 years since the last international nutrition conference, so without saying too much, my expectations to this conference were enormous. I was so exited to be there first-hand and witness global leaders and expert commit to reduce malnutrition in all its forms from overweight, obesity to hunger and micronutrient deficiencies. One of three round table discussions with experts and national delegates. The discussion one was was about accountability in nutrition. Unfortunately my excitement faded during the three-day conference, and speeches from The Pope and the Queen of Spain was not able to change that. The main source to this disappointment was the few specific commitments made from national policy makers. Only a handful of countries committed to specific actions or aims of malnutrition reduction, which in my opinion is not enough. I might be a bit naive, but I generally thought that the ICN2 was about committing specifically to how malnutrition should be reduced in local contexts. I see the Framework for Action as a broad set of guidelines, which should guide countries to develop context-specific actions. Very few tangible and measureable commitments were however stated by country delegates, which I think is unfortunate and not what I had hoped for. 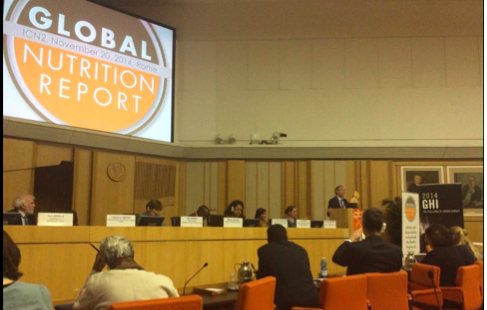 The Global Nutrition Report Launch in Rome. Dr. Lawrence Haddad is speaking. 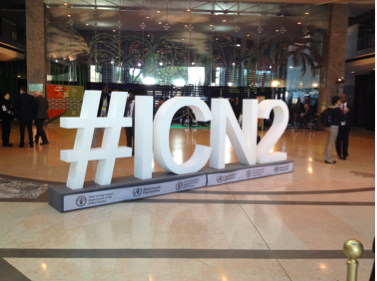 What the ICN2 did do was bringing together policy-makers from all over the world, and put nutrition on the global agenda. This is a large step in the right direction, however I still believe a larger number of countries should have made specific commitments and hence be accountable for malnutrition reduction. Since the first ICN back in 1992, global undernourishment has fallen by 210 million, however, over 800 million people remain chronically hungry. Two billion people still suffer from micronutrient deficiencies and over 500 million adults are obese. Personally I don’t think enough has happened since the first ICN. I hope the next 22 years will be different, however I have my doubts. There was also a bit of time to explore something else than the ICN2.